Who doesn’t love a s’more in the summer? But I have to tell you, the marshmallows are just gooey and that sticky sugar gets on my hands and face. Some people may love the toasted marshmallow the best but the best part of the s’more for me is the melted chocolate. The toasted marshmallow is just the way to melt the chocolate. Plus with most marshmallows, no one knows what’s in most of them. So I have been wondered-why not have something really good and gooey to melt the chocolate? And I came up with grilled fruit like bananas, strawberries, peaches or even pineapple! They are tastier to me than a marshmallow. And better yet, why not have the chocolate already melted with a few nuts added! 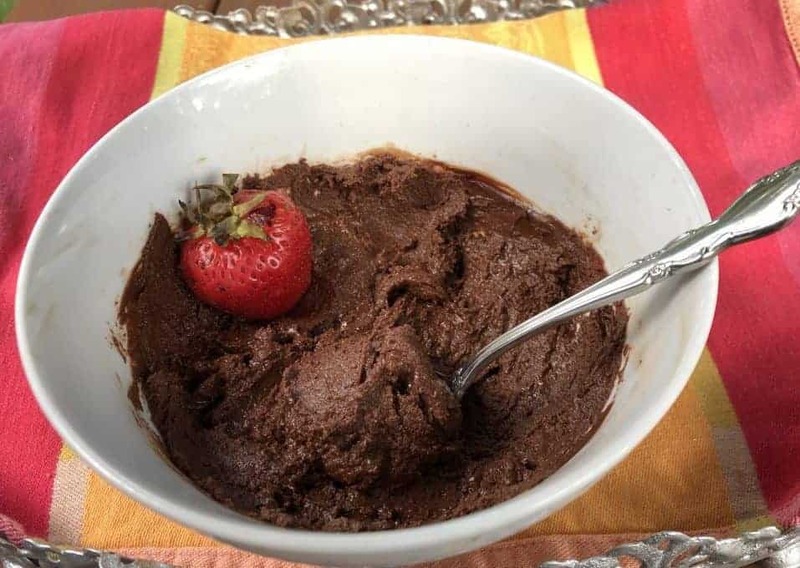 I love Nutella and it already has the soft, melted texture so that was the inspiration for the chocolate pecan dip below. In fact, you don’t even have to totally eliminate the marshmallow to enjoy some grilled fruit with it on your s’more! All these factors lead to the creation of these Grilled Fruit S’mores. And because the chocolate is already soft and melted, you do not even have to grill the fruit to get the gooey/melted chocolate goodness. You can just add some thin slices on fruit on the graham crackers that have been thinly coated with the chocolate pecan dip. I grilled my fruit on a wooden skewers on top of the barbecue grill but I am really envisioning, putting a piece of fruit on a long stick and holding it over an open flame from my fire pit. I haven’t had a chance to try it but it sounds like a fun and tasty alternative. And you can even eat these s’mores open faced and top them with all sorts of goodies like dried fruit and coconut. Check out other topping ideas in the recipe below! 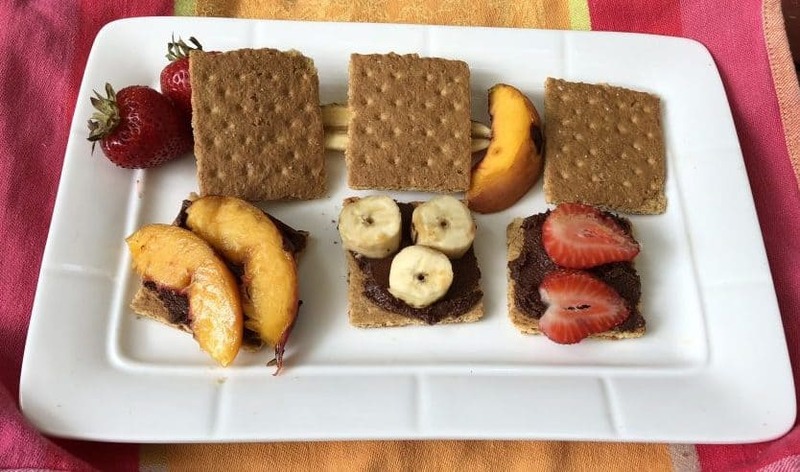 With the fruit, semi-sweet chocolate, nuts and whole grain graham cracker the s’more turns out to be not only a delicious, but very healthy dessert recipe with whole grains, fruits, nuts and antioxidants from the chocolate. I think it is also a very fun thing to make in the summer! Try some grilled fruit on your s’mores for some great flavor! Toast fruit carefully on a stick over an open fire. Grill fruit on the barbecue. If you roast it over a fire pit, make sure that you do not burn it. Take fruit off the grill and allow to cool slightly. Allow it to cool slightly and slice in thin pieces. Spread the chocolate dip thinly on the crackers and add grilled fruit and your choice of the toppings. Pecans, chocolate made into a creamy dip. That is heaven to me! Melt the chocolate in the microwave or double boiler, being careful not to burn it. In a food processor, process the nuts until they start to make a nut butter. Add the chocolate to the nut butter along with the honey and a pinch of salt and process. Put in a glass to container with a lid. This dip will keep several weeks in the refrigerator. And you can make so many other things with the grilled fruit with or without the chocolate dip. There are so many things that you can make! You can top it with ice cream, put it in a premade pie crust or on top of a pizza crust. You can even just dip the fruit or graham cracker in the chocolate! 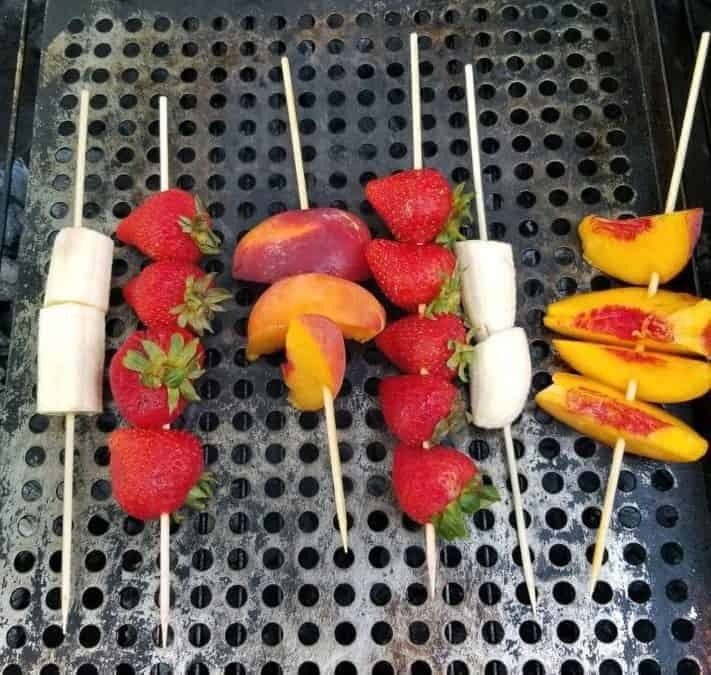 I hope that you will be inspired to try more fruit on the grill this summer and maybe even tried some Grilled Fruit S’mores! My favorite desserts usually have either fruit or chocolate in them and this was a fun way to add them both together in a fun way! 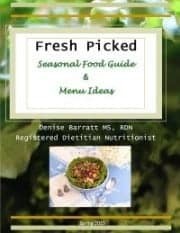 As a registered dietitian nutritionist living in Asheville, I love to share recipes in our kitchen with family, friends and readers! 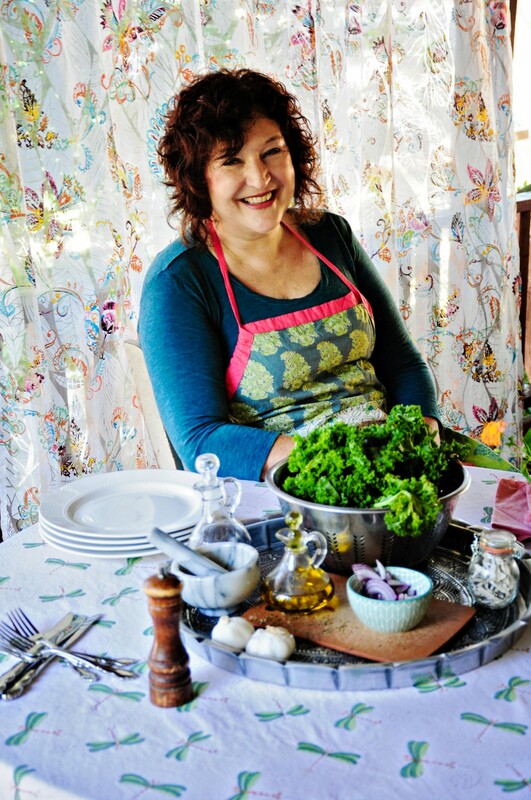 I hope that you enjoy some grilled fruit while so much of it is in season and I would love to know what you tried and how it went! Enjoy the rest of your summer! 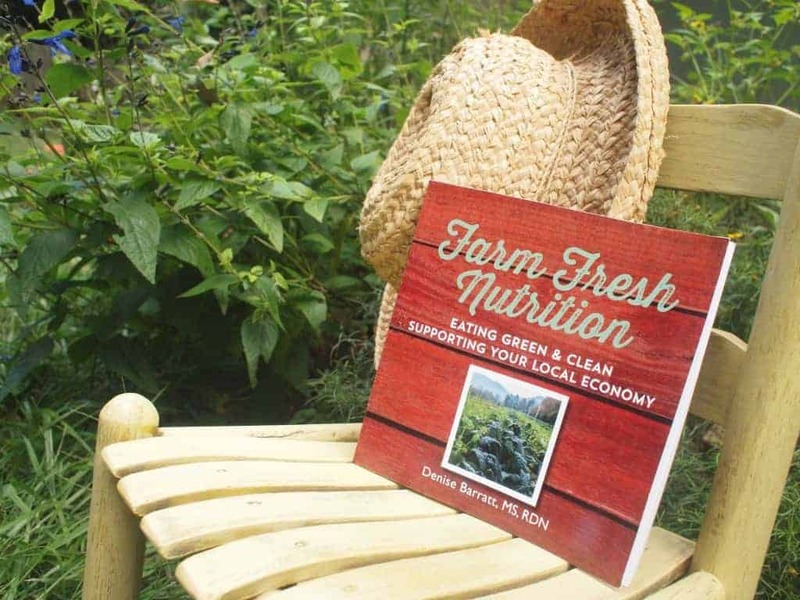 Now is the time to get outside and enjoy the long, sunny evenings! These smores can be served open faced or with a top!